This 'thangka' of the Dharmapala (protector) deity Vaishravana is one of the earliest in the gallery's collection. Vaishravana is venerated as a god of wealth, guardian deity of the North and a follower of the bodhisattva Avalokiteshvara. He is shown seated on a white snow lion, holding a jewel-spitting mongoose and a victory banner or standard. As is typical of 'thangkas', the deity is the central focus of the painting and is shown front-on, though sometimes in a schematic style. The picture plane is flat with no attempt at perspective. Rather the deity and his entourage are depicted in accordance with a hierarchical arrangement. 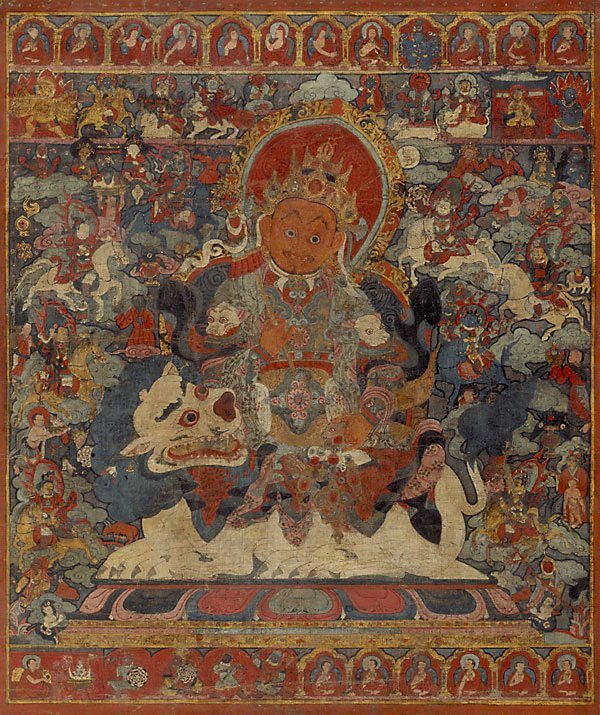 While this format and iconography conform to an accepted convention, it shows the complex compositional treatment favoured by the Newari artists of Nepal. This example also shows the influence of Chinese painting styles in its use of flat, loose colour, its decorative treatment and stylisation, and in the clothing of the central deity. The Asian Collections, AGNSW, 2003, pg.62. Art Gallery of New South Wales annual report 1998 , 'Collections', pg. 15-19, Sydney, 1998, 18 (colour illus.). The Asian Collections Art Gallery of New South Wales , Sydney, 2003, 62-63 (colour illus.). The colour illus. on page 63 is a detail of this work.